Hey everyone, I know school will be starting in the next few weeks, but I’m here to tell you about how fantastic Intex pools and accessories are! The PR person was so nice in sending us an Intex 8 x 30 pool so my granddaughter could have lots of fun this summer. However my granddaughter has been suffering with being sick, she’s either had an ear infection (2 since the end of June) or Sinus or upper respiratory infections. Not to mention we’ve had a lot of rain on the weekends which is when we see her. I’m hoping I can get the pool up for her birthday party this weekend. Fingers crossed for no rain because she is finally feeling a lot better and wants to play in her pool. 🙂 I’ll post pictures of her in the pool if we get to use it this weekend. We received the Intex pool for free in exchange for inclusion to my Summer guide. Many families find it challenging to have a pool for family fun due to the fact that they are restricted by cost of having one. I know the last pool we had 2 yrs ago, our water bill went up by $100! That’s expensive, but it was a lot of fun! This is the reason Intex developed a comprehensive line of above ground pool options with sizes and configurations to meet all kinds of needs and make the swim experience more accessible. Intex products are centered around quality, value and family time so no matter the size of a yard or a budget, consumers will be able to find a quality option to enjoy the health benefits and fun times of swimming. If you are still interested in having fun in this heat wave, there’s still time! I’ll have the pool and any water activity at home that my granddaughter wants to do until the temps start changing and for Louisiana that’s like October. Intex has expanded its extensive lineup of quality, easy-to-setup pools to fit the needs of swimmers of all ages. Check these out. 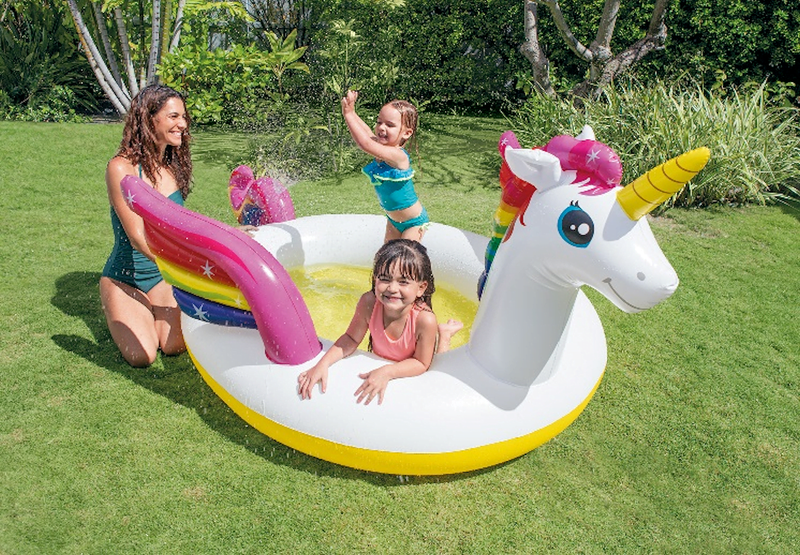 New Intex Mystic Unicorn Spray Pool – This rainbow unicorn pool delivers fantasy fun with its colorful horn, wings and mane and is a vibrant option to keep kids entertained and cool this summer! Designed for little ones 2+ and featuring a sprayer spout in its rainbow tail, the Unicorn Spray pool features a 40-gallon capacity and is constructed with durable 11-gauge vinyl for seasons of fun. 107”L x 76”w x 41”h (MSRP $19.99 available online and stores nationwide). New Intex Candy Zone Play Center – This “sweet” new play center is perfect for summer fun for your little one ages 2+. Attach your garden hose to the water sprayer and kids will have a blast slip-sliding down the slide and landing on the ‘chocolate bar’ landing mat that offers extra padding for little bottoms. From its jelly bean bottom and two colorful inflatable lollipops to its bright candy cane side rails for rolling 6 included balls down, this new play center is designed to keep kids cool and entertained this summer. 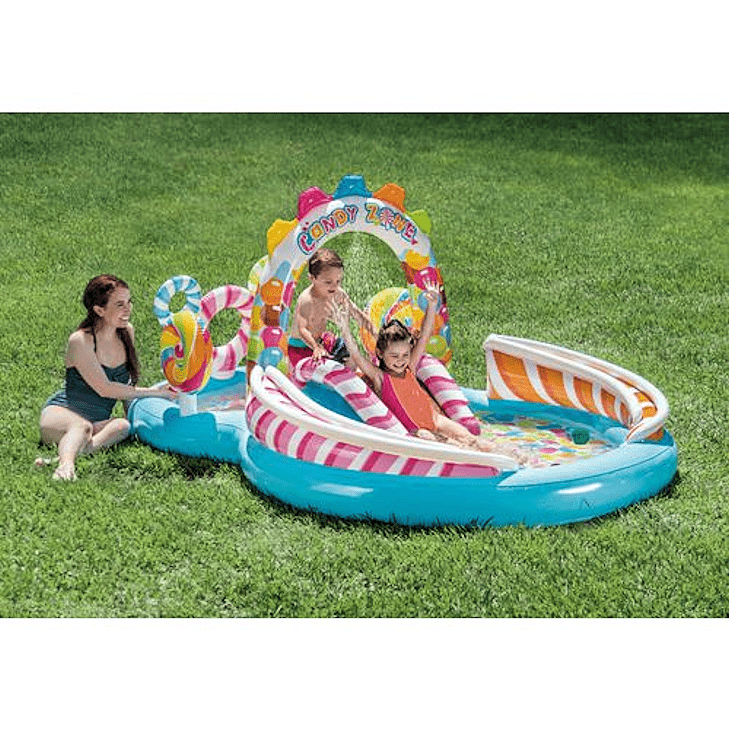 Designed with a maximum weight limit of 178lbs, the colorful play center features a drain plug for easy draining and durable construction for seasons of fun. (MSRP $49.99 available at online and at stores nationwide). Intex pools are available nationwide at a wide variety of big box, club, sporting goods and specialty stores as well as numerous online retailers. Head on over to intexcorp.com for more information on Intex. Intex is the world leader in inflatable products and above ground pools and is one of the most recognizable, trusted and innovative companies in the industry. For over 40 years, Intex has produced and marketed high-quality products including airbeds, above ground pools, spas, toys, furniture, boats and more. Intex is part of a worldwide family of companies whose objective is to deliver the highest quality products designed for comfort and fun and routinely tests finished products to make sure they meet our elevated standards for quality, safety and value. Intex is committed to decreasing its impact on the environment and for over 10 years, has worked to reduce the amount of plastic waste used by implementing a comprehensive PVC recycling program.